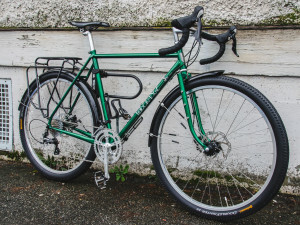 Many have heard of touring bikes, but few have heard of gravel touring. It’s not quite road touring; it’s not quite mountain biking; it’s not quite cyclocross; so then, what is it exactly? Gravel touring has a long heritage, stretching back to prewar Europe. In those days, off-road riding was necessary as road networks weren’t as developed as they now are today – a straight road bike would soon run into problems. 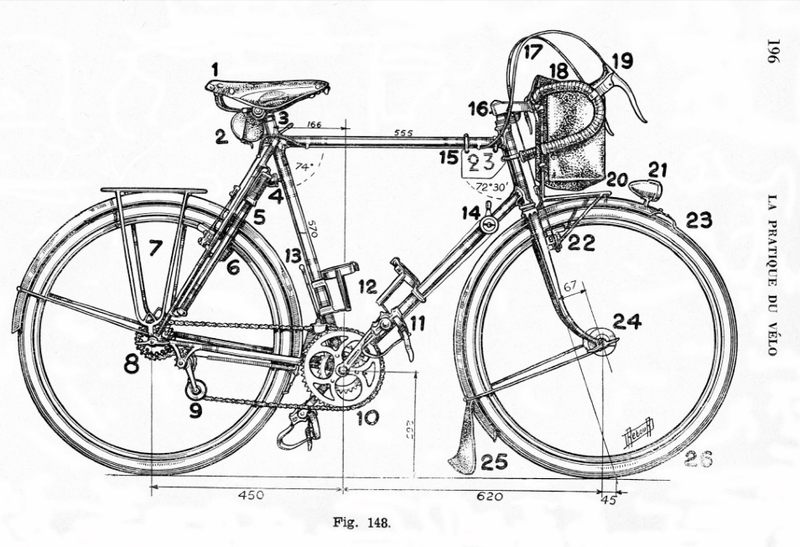 Bikes developed by some of the best-known French constructeurs such as Alex Singer and Rene Hersé were the original do-anything bikes, kitted out with many features to facilitate long-distance riding and enjoyment of the cycling experience while still being light, capable, high-performance machines. 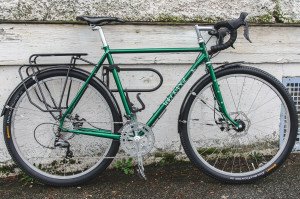 Modern gravel bikes such as the Velo Orange Polyvalent draw directly from this rich heritage, while updating them with modern materials and conveniences. A recent build that we did for a customer features Velo Orange Grand Cru Drillium cranks – these feature many small drilled holes, which was a technique often used to lighten bike components and to add character. 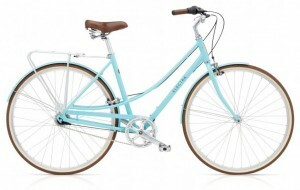 This bike also has a 1″ threaded stem and curved front fork blades for added classic bike chic. Like many multipurpose bikes, it is capable of fitting wide tires – in combination with the smaller 650b wheelsize, halfway between a 700c road bike wheel and a 26″ mountain bike wheel, these wide tires offer better performance on rough surfaces and off-road with stronger, faster-rolling wheels than an equivalent 700c wheel, while being faster than a mountain bike wheel. In addition, higher-volume tires can decrease flats, about which more will be said in a future in-depth blog post on wheel size and tires. 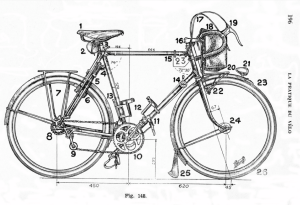 All these classic features are enhanced by the addition of modern bicycle technology. 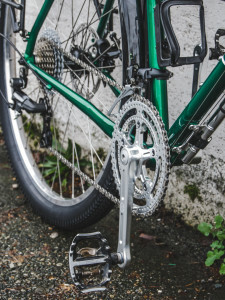 A 10sp rear indexed rear derailleur with road-style shifters makes shifting easy, predictable, and fast; modern polycarbonate fenders are light, durable, and corrosion-proof; an rear pannier rack made from modern aluminum alloys is light and strong; disc brakes provide powerful, predictable performance in all types of weather; clipless pedals provide a better connection to the road while their dual-sided design allows their use with regular shoes; and a modern Abus lock protects this beautiful and high-performance bike from theft. So, what’s gravel touring? It’s biking, but more – more fun, more versatile, more go-anywhere. The sky – or the horizon is the limit. 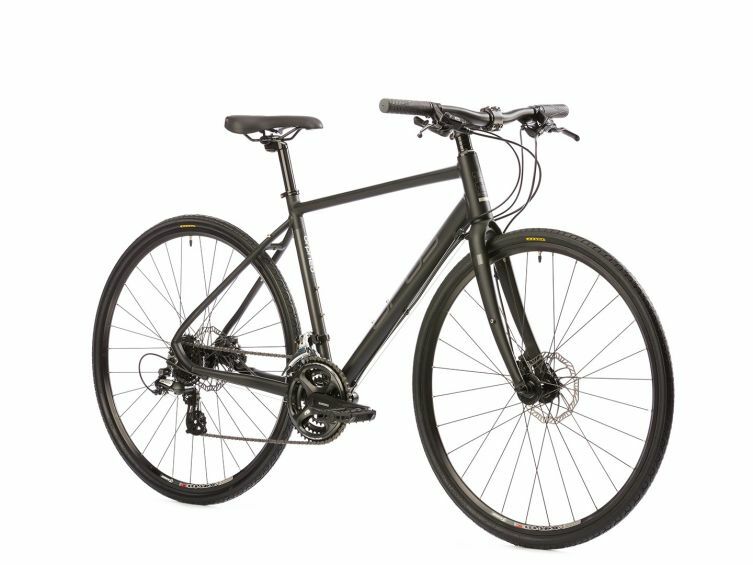 Living in Vancouver and looking for a new bike to commute with? Now’s a Great time to get in on a sweet deal for some of our remaining 2017/2018 clear-out bikes. Don’t get us wrong, we LOVE these bikes, but with all the new technology coming in for 2019, we just HAVE to make some floor space. So here’s you chance to save some big bucks! How a about the Opus Zermatt Men’s 24 speed Disc Brake? 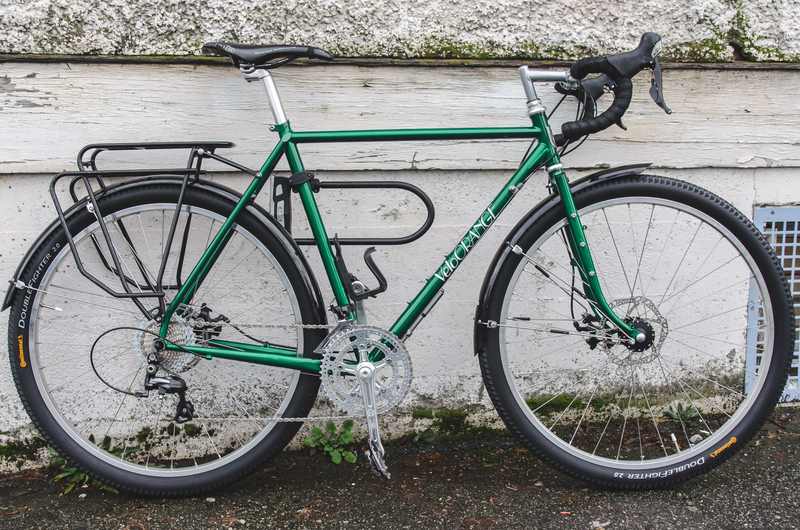 Starting at just $495 for a Fully-equipped with rack, fenders and double-legged kickstand! You cannot beat this deal for a quality bike, that includes Life-time warranty on the frame and fork, AND Free tune-ups in the first year! 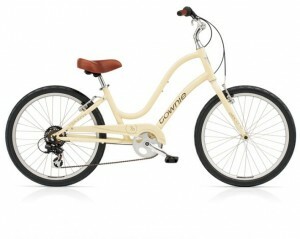 Townie Commute – Seriously Comforable and Great and Hills! For an even more Comfortable Commute, we have the Electra Townie Commute 27D, with Hydraulic Disc brakes and a gear-ratio built for climbing hills. This bike rides like a Light SUV! 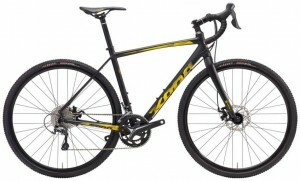 Big Savings at just $795, So Many Features, including DYNO Lighting System, and SCHWALBE Fat Frank 700c Tires!! WOW!! The Kona Dew Deluxe is a fantastic light-weight fully equipped commuter with Hydraulic Disc Brakes. We wouldn’t even bother to put this one on sale, but we need room for those new 2019’s. Another great Disc Brake option! Opus Orpheo 4 – Regular $750, Sale $495 !! If you’re lucky enough to be size LARGE, This Deal Is YOURS! These Deals are for a limited-time and WHILE SUPPLIES LAST! Have you ever found yourself wishing you could ride your bike to the store, the park, to work, but it’s a little bit too far? Or gone shopping on your bike and ended up buying things that are a little uncomfortably heavy? Or do you need the range of a car, but hate parking in Vancouver? (who doesn’t) If so, an electric bike might be right for you! Electric bikes have come a long way since their conception. 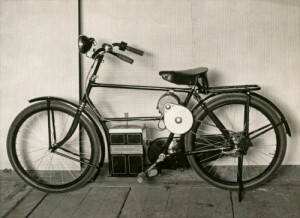 As early as the 1890s, US patents were being filed for electric-assist bikes, and e-bikes were available to consumers in a variety of configurations. These early e-bikes, however, were heavy, due to the materials in use at the time, and specifically due to the lead-acid batteries used to power them. Luckily, today we live in a different world. Advances in materials have made quality e-bikes lighter, more powerful, higher range, and more pleasant to ride than ever before. Modern e-bikes often have frames of high-strength, low-weight aluminum, optimized geometry for the bike’s expected style of riding, powerful, compact motors placed in optimal drivetrain configurations, fully weather-sealed components, and energy-dense, light, fast-charging lithium-ion batteries. 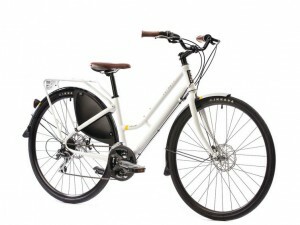 What this means for a potential e-bike user is that not only do quality e-bikes ride like a normal bike, but they also provide the assistance you need, when you need it. Need to go that extra 10 kilometers? You can. Filled your bags too full of groceries? No problem. 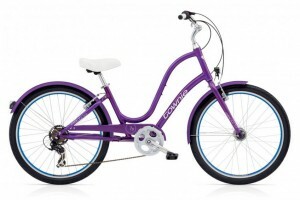 Want to go on a long bike ride with your fit friend, child, or grandchild? You’ll leave them in the dust. Hills getting you down when you want to go down to Spanish Banks? Leave it to an e-bike to get you back up. As for maintenance issues, quality e-bikes are built with weather and wear in mind, so maintenance on the e-bike components will be minimal. 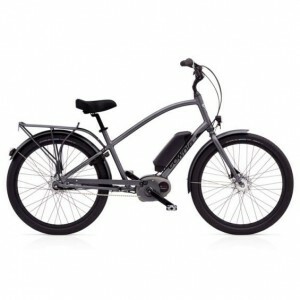 In addition, the electrical components of all the quality e-bikes we sell come with at least a two year warranty. Legally, an electric bike is considered a regular bicycle, as well, so you won’t need any more safety equipment than you would need with a regular bicycle. However, one thing this entails is that the e-bike motor can take you to a legal maximum of 32.2 km/hr on level ground; if you’ve ever gone this fast on a regular bicycle, you’ll know that is pretty fast. So, to conclude, who are e-bikes good for? In Vancouver, e-bikes are good for everyone! Many of our quality e-bikes come decked out with everything you could need for Vancouver and its weather – most have rain-defeating fenders already fitted, and some come with cargo transportation components ready-fitted. 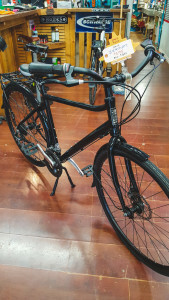 No matter your cycling experience, check out our catalogue of e-bikes, call (604) 559-9494 to book a test ride, or come down to Denman Bikes at 2607 Main Street and try out one of our e-bikes for yourself today! So what is a Performance “Commuter” Bike? THE COMMUTER BIKE IS YOUR TICKET TO COMMUTING PERFORMANCE & PLEASURE! When you think of commuting, what comes to mind? Are you stuck in traffic inside your car, or trying to find a seat on an overcrowded bus? What if we told you there was another way…a faster, more economical and hands-down FUN way to commute? There is – it’s on a bike. But not just any bike – the commuter! A commuter ride is light, fast and equipped with a large gear range. Also, instead of cycling with an upright posture, as with a city bike, the rider is angled slightly downward. This is termed a more “aggressive” position, where the angle is all about power. This angled riding posture allows you to really dig down into your pedals and get a much more effective stroke each time around. It is also a better position to tackle those hills that are probably somewhere along your route (while making use of all those gears!) – Vancouver doesn’t always make it easy, but the commuter does! The Brooklyn Roebling is a lightweight commuter bike with 24 speeds and a derailleur – easy to ride and perfect to customize. The Brooklyn Lorimer comes in matte ivory, boasts 25 speeds and a lightweight frame that comes in smaller sizes to accommodate petite riders. The Kona Dew Plus and Kona Dew Deleuxe are great examples of quality Kona bikes with a broad gear range, high performance hydraulic brakes that offer consistent, superior braking ability in wet conditions. 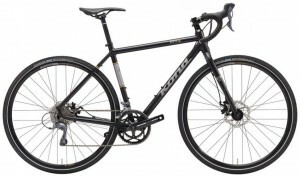 Some Have Drop Bars – These Make Great Touring Bikes, too! The Kona Rove AL and Kona Jake are sporty, performance-oriented bikes that can tackle just about any adventure, be it the route to work or a weekend tour. The drop bar orients the rider in an “aggressive” riding position, angled downward. 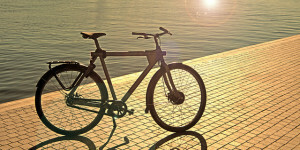 SAVE MONEY – Switching your car out for riding a bicycle is an amazing way to save 100’s, even 1000’s of dollars a year! Bikes are free to ride and inexpensive to maintain and repair. If you’re looking for a budget hack, this is it! GET OUT OF TRAFFIC – Don’t spend a minute more in the car than you have to! Starting or ending your day on the bike is energizing, instead of infuriating. With most Vancouver buses equipped with bike racks, you’re always good to go no matter what. GET IN TO SHAPE – Commuting by bike is the easiest way to get in shape without spending time (or money) in the gym. Cycling is a excellent cardiovascular exercise, known for building endurance and burning fat. Set the pace you’re comfortable with – and be amazed at how quickly your strength grows. HAVE FUN!!! – The best part! At its core, riding is fun. Getting to and from work doesn’t have to be a chore – enjoy yourself and experience the pleasure of cycling! 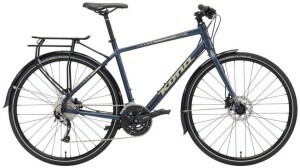 KONA BIKES NOW IN STOCK!!! We’re now carrying Kona bikes at Denman Bike Shop! We’re beyond stoked to be offering a great new 2017 line-up of Kona bicycles. Kona is an industry legend designed by, for and in Vancouver City! Kona is based right out of beautiful Vancouver, British Columbia, and has an excellent reputation around the world. Kona is known everywhere for its cool bikes, and has earned a reputation for creating consistently well-designed rides at a seriously competitive value. Kona has an excellent reputation for a reason: nothing they make is below the high standard of quality everyone has come to expect from this home-grown, West Coast, Vancouver-based bike company! We’ve got an array of solid 2017 flat bar commuters and even a couple drop-bar road options that look great and feel even better. These bikes are ready for the city and the trail, and for whatever adventure you’re about to take next. Come test ride our brand new 2017 models and feel the Kona experience for yourself! Are you a woman under 5 feet, having a hard time finding an adult bike that fits your smaller size? Does your past bike experience involve teetering on a bike that was too big for you, and you were afraid you’d hurt yourself? Or have you been told, you need a “Kids Bikes”? Left riding at the back of the pack, on a poor quality bike? 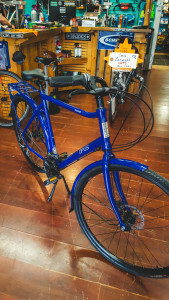 Well, if you’re like many of our customers of “smaller” stature who are in search of a comfortable, fashionable, and quality bike that will let you ride with confidence and style, we’ve got some great choices for you! In the Fashion and Comfort line, we just love these step-through models because of how easy it is to get on and off the bike, for starters…. When it comes to a bike that can comfortably accommodate a petite rider, especially one that is nervous about riding, or perhaps has body pain or joint issues…. 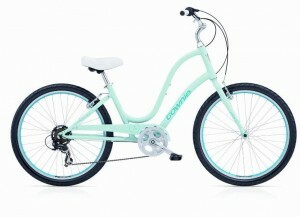 The Electra Townie rules them all. With its incredibly intelligent design, the Electra Townie allows the rider to put their feet Flat on the Ground, when not on the pedals. That’s right, you heard it, FLAT on the ground. Ride for a bit, feel nervous? Stop and put your foot flat down! Furthermore thanks to a light-weight aluminum step-through frame and very adjustable seat and handlebars, its much easier to fit a petite rider, and allow them to gain confidence with their ride. Now, not to imply that petite riders in particular might be nervous about riding, but I do find often they start out that way, in particular because of past experiences. For the Townie, there are two size choices, and a few gearing/colour options. The majority of riders at or about 5 feet, can ride the regular ladies 26” wheel, no problem. 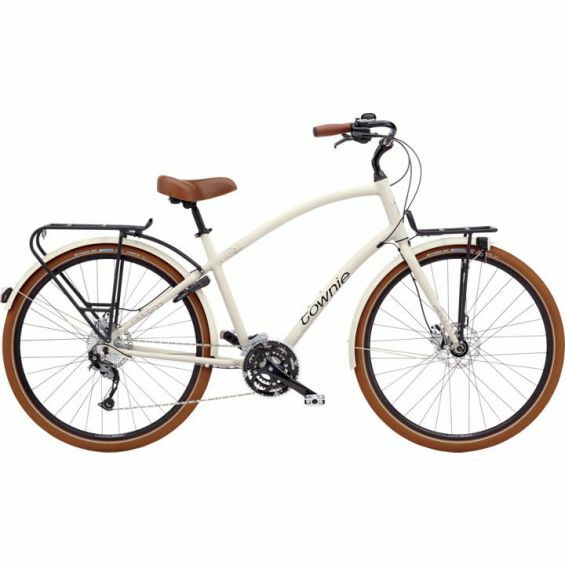 Plus, for even more petite riders there is also the 24” Wheel Townie… The most popular model, is the Townie Original 7D, in fact it’s so well-loved that this particular model sold more than any other brand-bicycle in the USA for the last 2 years! For those a little more confidence, these City bikes provide a comfortable and efficient ride. 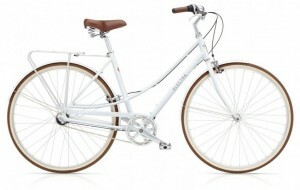 Some of our best selling bikes for petite ladies are the Brooklyn Willow and Brooklyn Franklin. These upright city bikes are made of Chromoly Steel which make them more comfortable than aluminum and lighter than traditional steel. Thanks to the step-through frame, shorter seat tube, and 26” wheels with narrower tires, we find riders at approximately 4’8” can confidently ride this bike in the S/M size. Since the seat height and swept back-upright handlebars are very adjustable, the Brooklyn bikes are also great choice for growing teenagers who are looking for a fashionable bike with room for growth. 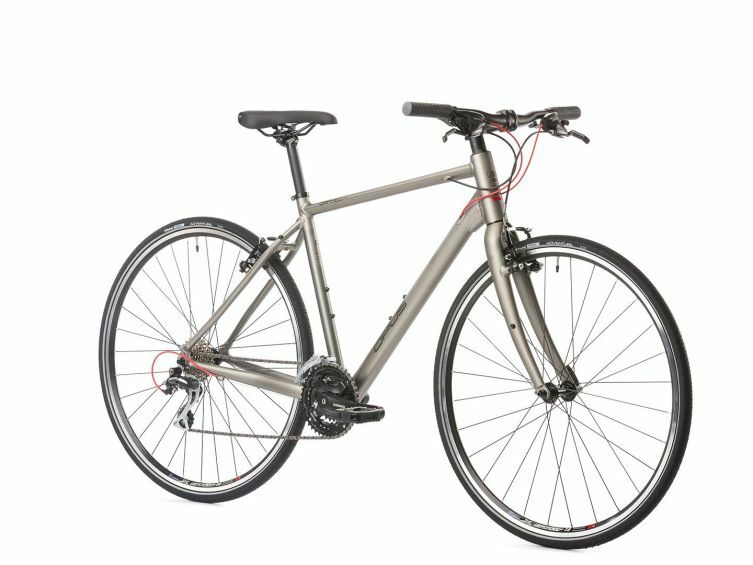 The Willow has either 3 or 7 speeds with Internal Gears (really clean and low maintenance), and the Franklin has a 7 speed external (like a mountain bike). And if you don’t know what Internal Gears vs. External gears are, don’t worry you’re like many of our customers. This, we’ll happily explain to you and will be the topic of future blog post! 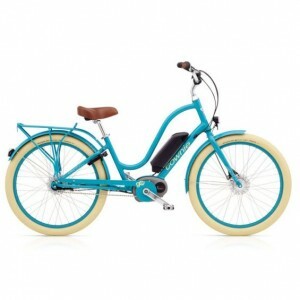 In 2015, Electra re-designed their hugely popular (Oprah’s Favorite Bike), in a smaller size. The Electra “Loft” has such a pretty frame, and thanks to their expert engineering, Electra were able to design a petite bike that still has City Style-27” wheels (700c). So, the rider doesn’t lose any efficiency as a result of riding on smaller wheels (like on a kids 24” wheel). The aluminum frame is nice and light too. The Loft is available in 3 gearing options and some lovely colours. 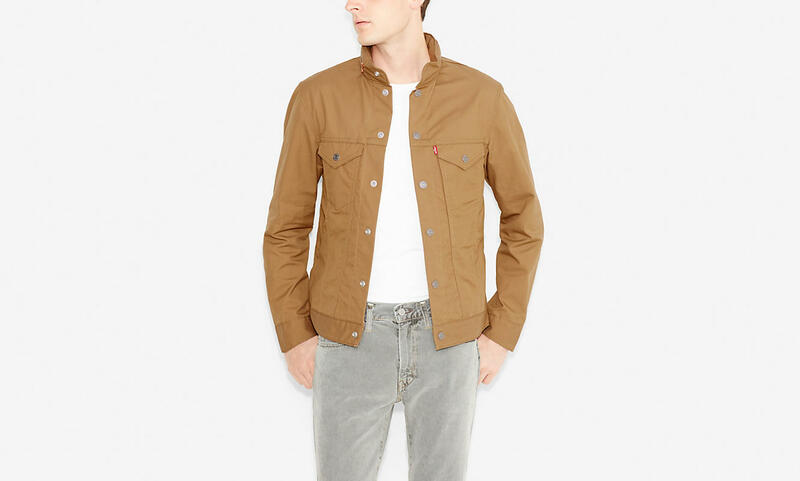 With Linus, it’s all about style! We have many customers who fall in love with Linus at first sight, with their mid-50’s French style, deep step through frames, and huge array of matching accessories. Linus owners continue to love their bikes because of how they ride; which is super comfortable, upright and easy! The size small Dutchi has 26” wheels and a smaller frame and accommodates a rider around 4’9 to 5’3. Internal 3 or 8 gears are available. A slightly sportier model, the Opus Classico or Zermatt are light-weight aluminum step-through frames, with a little more performance than just a cruiser. 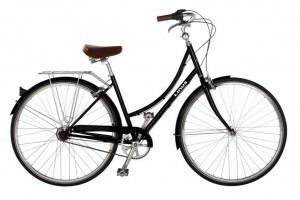 The Classico has 7 speeds, with a derailleur and the Zermatt features 24 speeds and disc brakes. 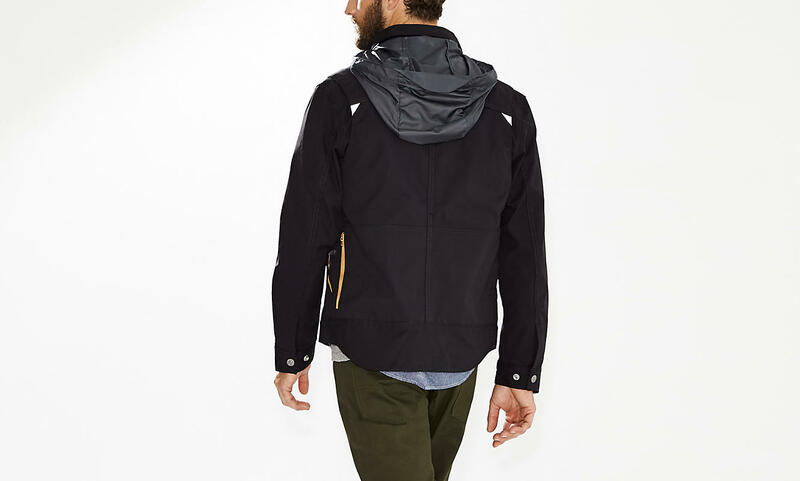 Great for the serious Vancouver all-weather commuter who still wants to be comfortable! Regardless of your level of research, here at the Denman Bike Shop, we welcome you to come and test ride any of our bikes. Don’t be shy, we’re here to help! Sincerely yours.. a little vertically challenged myself… the Red Head. Looking for a price friendly commuter with the room to fine tune the details? Look no further than the Brooklyn Roebling. 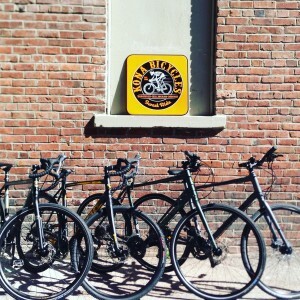 The Brooklyn Bike Company, based out of – you guessed it – Brooklyn, prides itself on thoughtful design and top quality parts at a reasonable price point. 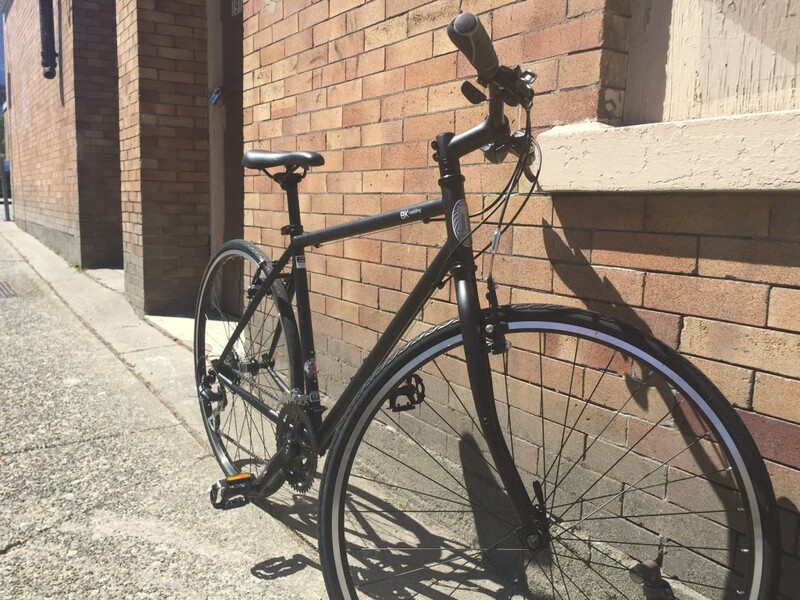 The Roebling is a slick looking, comfortable and agile frame, ready to go as-is, or to customize and build the perfect Vancouver hybrid commuter. Like all Brooklyn bikes, the Roebling’s frame is uniquely proportioned over a broad range of sizings, from the very petite to the extra tall. While many bike brands use factory standard frame geometries, Brooklyn’s approach involves engineering their frames to provide as full a leg extension as possible while still being able to reach the ground – without ever leaving your seat. A full leg extension means more power with each pedal stroke, providing a faster, more efficient ride. Being able to put your foot down keeps you steady and confident in the saddle, without having to dismount in a hurry. 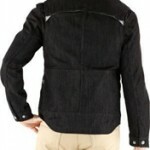 The result is a riding position that offers control and comfort combined. Built of strong chromoly steel, the Roebling features thin tubing and an overall light-looking design that doesn’t compromise on strength. The flex of chromoly steel also helps to absorb the vibrations caused by uneven and rough road surfaces along your commute. Other sweet features include puncture resistant tires and grips moulded to fit the shape of your hand, resulting in greater comfort over long trips. 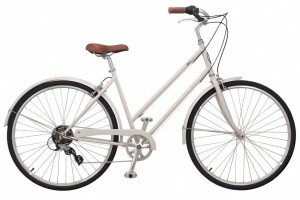 Offered in stylish matte finishes of both light white and black, the Roebling’s braze-ons (that’s fancy speak for screw holes already in the frame) make your bike super easy to kit out with front and rear fenders, front and rear racks and any other accessories you need to make it the perfect, personalized commuter. Come in to one of our Vancouver Bike Shop locations and test ride yours today! Here’s a little “Bike 101” on some of the basic things to consider, to help you find the right bike. 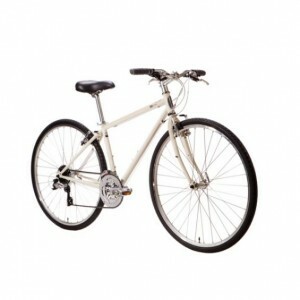 Whether you’re a Comfort, Casual or Commuter Cyclist, Denman Bike Shop has a variety of bike options for you. What is the Right Frame Style for Me? UP- Right and Comfortable, or Bent-Over Performance Position? Riding in a bent-over performance position, is more aerodynamic, and allows you to use more of your core muscles and upper body power to pull on the handlebars; as if you were rowing. However, this position can be hard on the lower back, neck and wrists. With the design of more upright city, comfort and commuter bikes, many people prefer the feeling of cycling in an upright position. You have better eye contact with drivers, your shoulders are relaxed, and you can maintain this position for a longer period. The degree of upright-ness depends on the frame design and handlebars, and can even be customized to your preference! While traditional the step-thru bicycle has been associated with women’s frames, many men enjoy the comfort of a step-thru bike, and we have a number of options that allow a Gentlemen to ride a style appropriate step-thru bike. 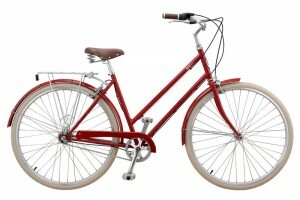 Classic Frames are traditionally associate with Men’s bikes, but many women like the look and feel of the classic frame. Typically speaking this type of frame design provides more strength , and may be preferred by a taller woman, for example. 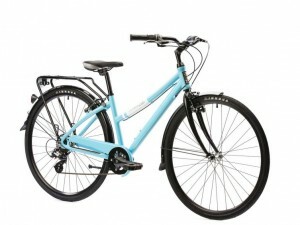 Your typical comfort-city, cruiser or urban performance bike may come n either a Hi-ten Steel, Aluminum or Chromoly frame. 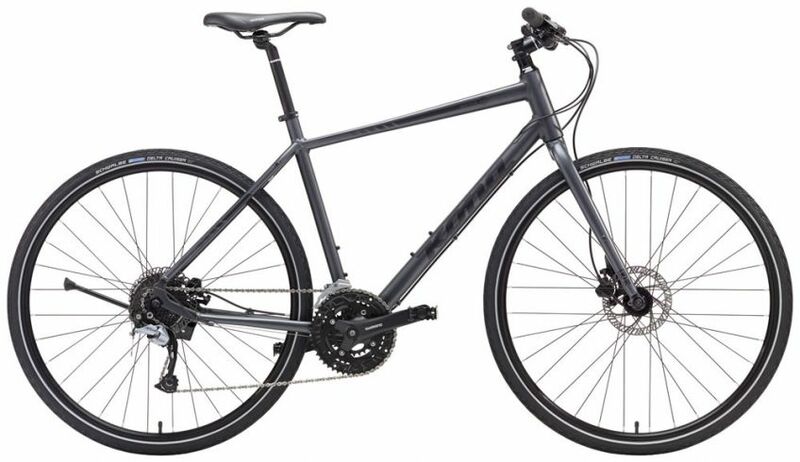 Hi-Ten Steel Frame bikes are a little heavier, usually cheaper, but do offer more compliance in the frame and some people prefer the feel of real steel. Chromoly is a type of steel, that is stronger and lighter than Hi-Ten Steel. The discerning cyclist may say that Chromoly has a better feel. Sometimes, a bike may be Steel with a Chromoly fork. What kind of gears and brakes do you need? What kind of gears and brakes you need depends on your preferences, level of physical fitness, how heavy your bike is, how far you’ll be riding and how steep the hills are! Gears – Internal Or External? External gears are traditional gearing system with cogs (chain rings) and a derailleur which changes the gears by moving the chain from one cog to another, either increasing or decreasing the level of resistance. This type of “drivetrain” can be lighter than internal gears. Quality levels for External gears vary dramatically. In this type of gearing system, the gears are enclosed within the wheel’s hub. There is no derailleur. It is a very clean, very low maintenance type of system. The most common are either 3 speed, or 8 speed. It may not sound like a lot of gears, but the range is actually quite wide. 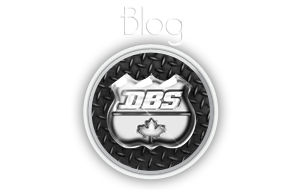 Brakes – Hand Brakes, Foot Brakes, Disc Brakes, Roller Brakes – Oh My? Are so easy to use, that’s how they teach kids to ride a bike. Just pedal backwards and you will stop. This type of brake is normally found on an internally geared bike hub, but not always. Have Standard rubber brake pads, are easy to clean, and affordable. They do wear out faster, and are not as effective in the rain. 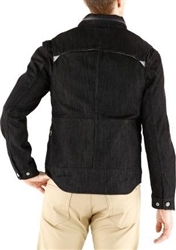 Are good for Commuters who ride year round, including in heavy rain. Though, more expensive initially, in the long run maintainance is generally less as the pads last a lot longer. In some instances they can be a bit noisy in the rain, and are susceptible to “parking damage”. The Brakes are contained within the wheel out of the way of dirt and damage. Comparable in performance to Disc brakes, hub brakes offer Zero Maintenance, consistent stopping power and nicer “lines” on a fashionable bike . They also make a great upgrade on a bike that can’t accommodate a disc. How Do you know which one is right for you? The best way to choose a bike is to come in and test ride! And remember, almost everything on a bike can be customized or personalized to fit your function or your fashion!